A regular contributor to CJAD radio since 1986, her audience tunes in because she knows how to save them time and money when shopping. She tells them where to go for the bargains, who to call when something breaks or where to find the impossible-to-find item. Sandra's listeners, readers of her book and her online audience learn to stretch their pay checks, making them go as far as possible. 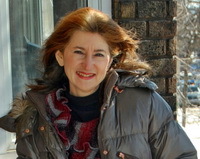 Sandra is a native New Yorker with a Masters degree in Art and Education from the City University of New York. Her passion for learning and travel has taken her to 41 countries, 47 U.S. States and all 10 Canadian provinces. During and after her adventures, she reports (sometimes with her husband Stan Posner) for their travel blog (www.travelsmartplanet.com), twitter, Instagram , travel radio, e-zines, print media, YouTube and podcasts. Together she and her husband have written the best-selling guidebook, Drive I-95:Exit by Exit Info, Maps, History and Trivia (www.drivei95.com) , now in its 6th edition (and an e-book, a phone app and an iPad app). They have made appearances in over 100 newspapers, many TV stations, over 40 radio stations and dozens of web sites in the U.S. and Canada. NBC-TV has interviewed them about a reality TV show based on their adventures, and NPR aired them across the US, so they anticipate a radio or TV series some day. She has lectured for the Greater Montreal Convention and Tourism Bureau groups and conventions and for the Independent Book Publishers Association. Sandra has been featured in ENROUTE magazine as one of their "Remarkable People", in L'ACTUALITE in their Passionate People feature, and in CHATELAINE as one of Canada's smartest shoppers. Member: Travel Media Association of Canada (TMAC) www.travelmedia.ca, Independent Book Publishers Association (PMA) www.ibpa-online.org, Association of English-language Publishers of Quebec (AELAQ) www.aelaq.org, Small Publishers Association Network (SPAN). Sandra Phillips has been the shopping guru for the past twenty years. She has written in, been written about and appeared in hundreds of media outlets.